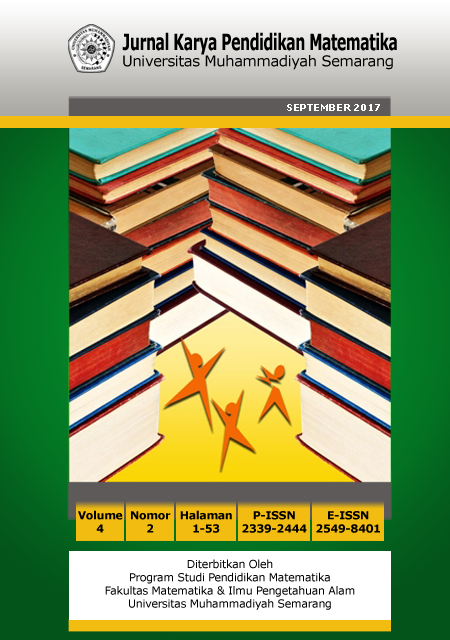 JKPM | Jurnal Karya Pendidikan Matematika | P-ISSN: 2339-2444 E-ISSN: 2549-8401 is peer reviewed journal that contains the work of the field of educational research or teaching mathematics, mathematics, mathematical applications, mathematical computerization and models of mathematics education in the learning process. JKPM published twice a year, every April and September. Registration and login are required to deliver goods online and to check the current delivery status. Already have a User Name / Password for Journal Karya Pendidikan Matematika (JKPM)?